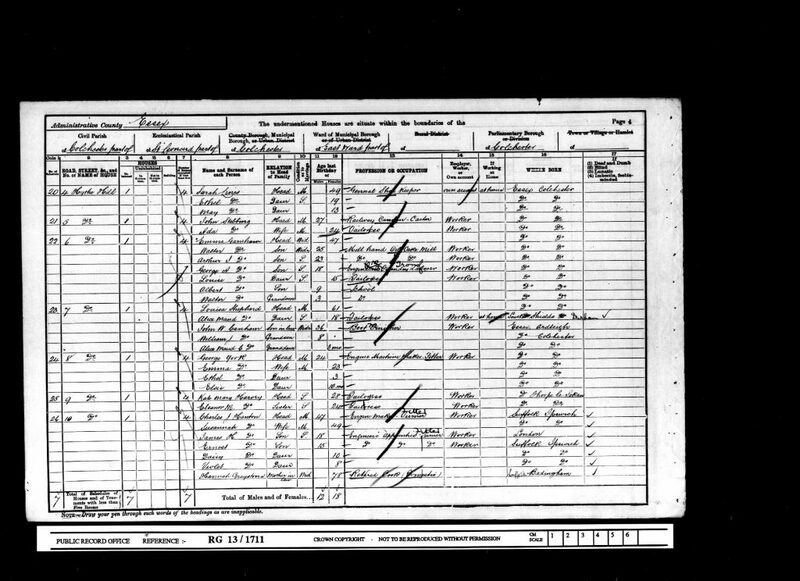 James Hiram Hanton was born in the 2nd quarter of 1883 in Old Ford in Middlesex to iron and engine turner Charles James Hanton and Hannah Hanton nee Grayston. 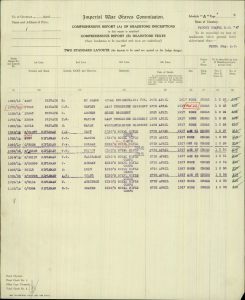 At the time of the 1891 Census, the family lived at 10 Great Whip Street, Ipswich, Sussex. Charles was still working as an iron turner and Hannah was looking after their children: Horace, James, Ernest and Daisy. The household further comprised of Charles ’ mother in law, the widowed Hannah Grayston. Hannah was working as a cook. 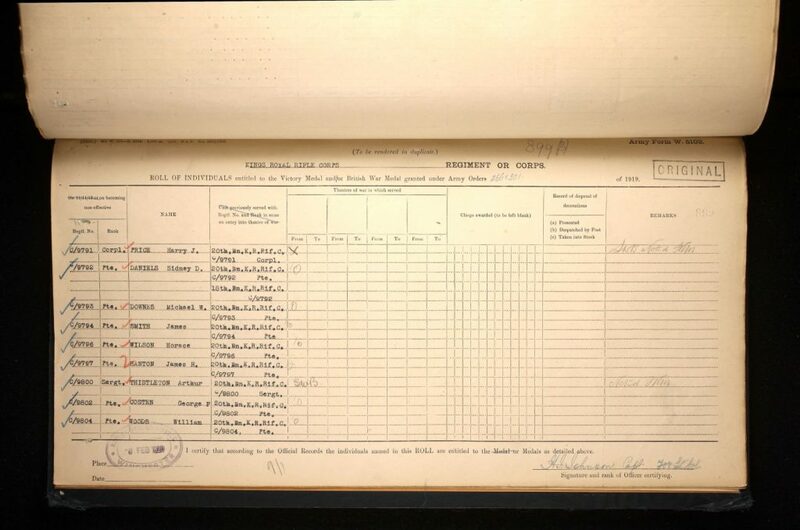 At the time of the 1901 Census, the family lived at 10 Hythe Hill, Colchester, Essex. Charles, still, as an engine turner and fitter and Hannah was at home. The household further comprised of their children: engineer’s apprentice turners and fitters James and Ernest, Daisy and Violet and the retired Hannah Grayston. 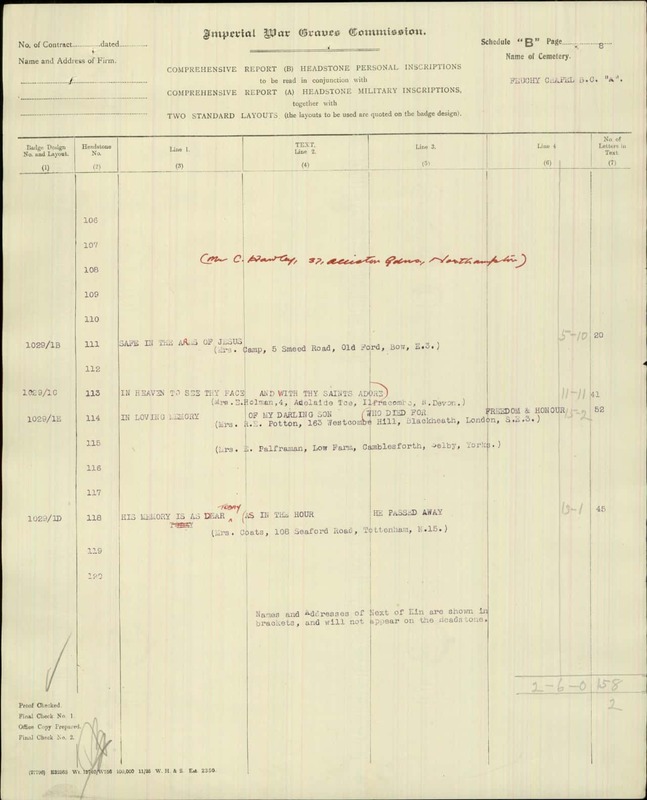 James’ father Charles James Hanton died in the 2nd quarter of 1906 in Colchester, Essex. 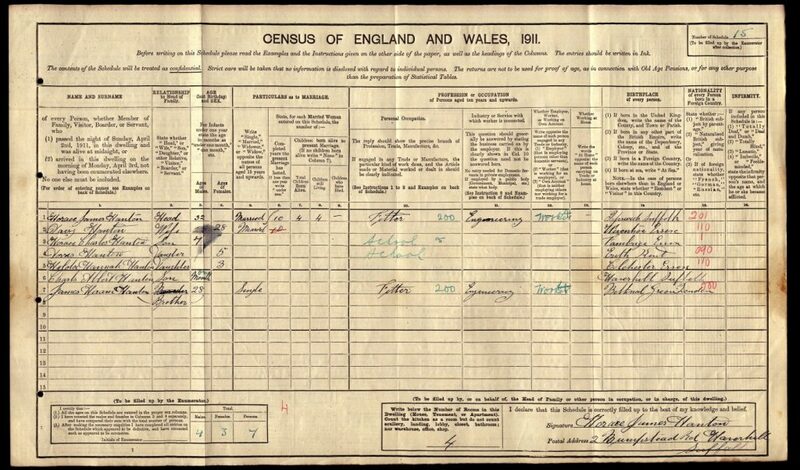 At the time of the 1911 Census, James was a boarder of his brother Horace at 2 Bumpstead Road, Haverhill, Suffolk. Both brothers were working as fitters. The household further comprised of Horace’s wife Daisy and their children: Horace Charles, Doris, Hilda Hannah and Charles Albert. The accommodation had four rooms. 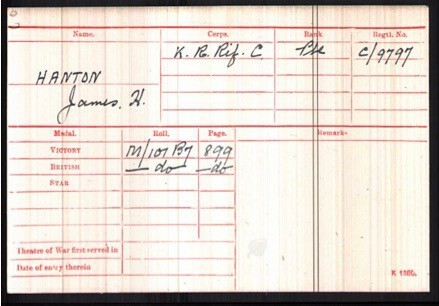 James enlisted in December 1915 in Benthal Green, London into the 20th Battalion, the King’s Royal Rifle Corps. 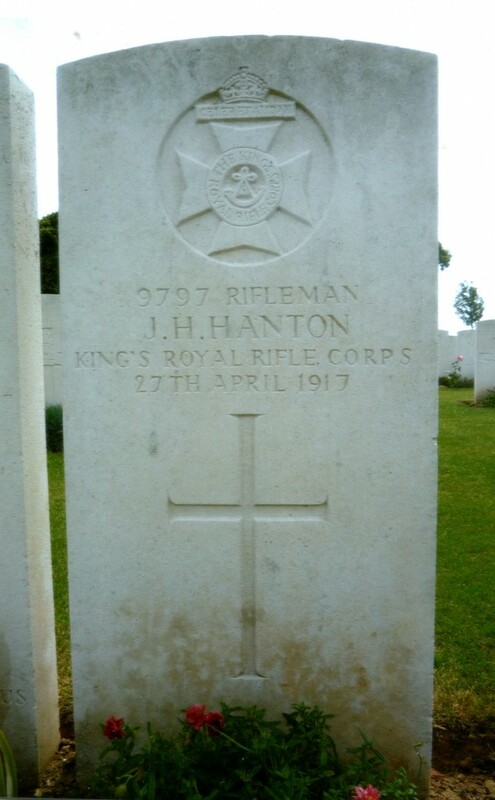 He was a Rifleman with regimental number: C/9797. 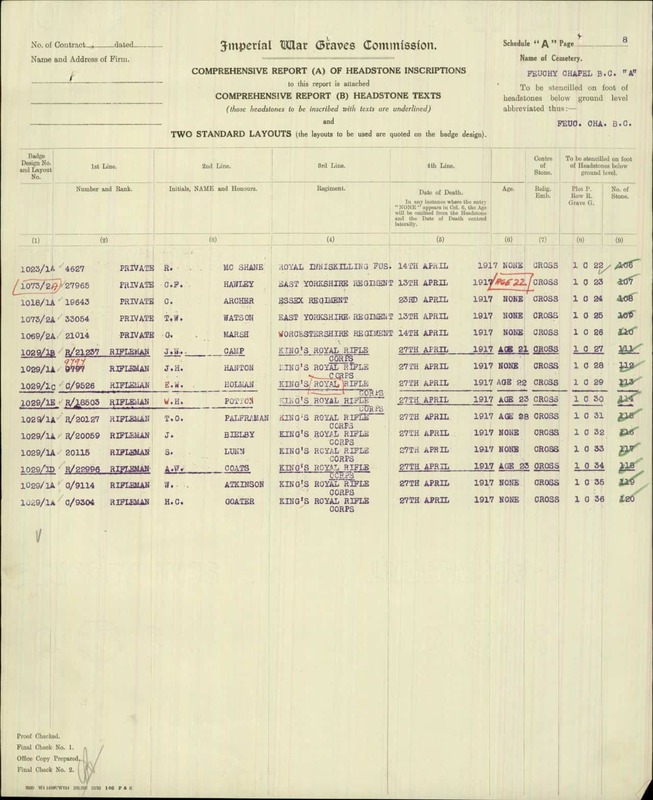 At the time of his enlistment he lived in Dorking. Before joining the Army, James was employed as a fitter at the Gomshall Tannery. 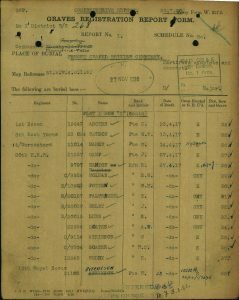 James went out to France in March 1916. 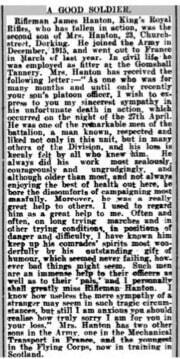 He was killed in action on the night of 27th of April 1917 in France. He is buried at the Feuchy Chapel British Cemetery in France. His grave reference number is: I.C.28. 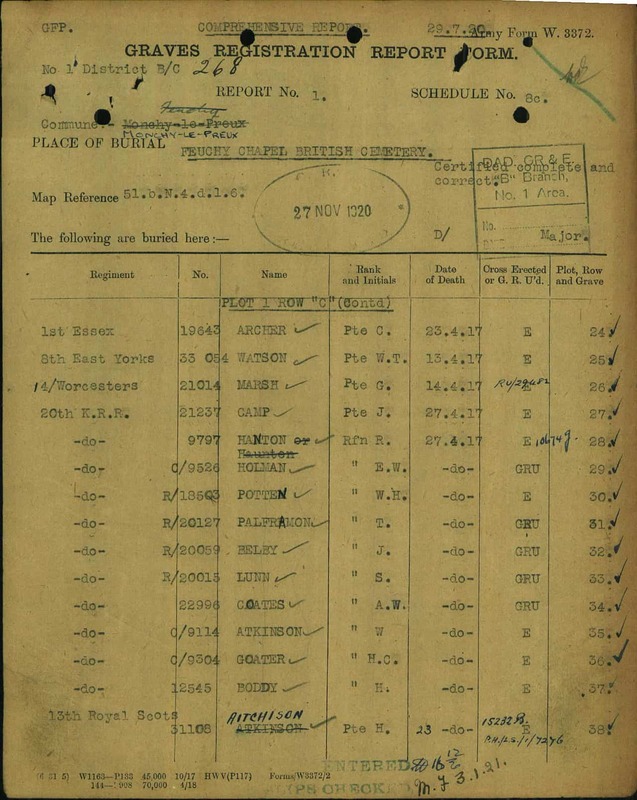 James ‘ mother Hannah Hanton received £5, 18s and 4 d on the 26th of September 1917 and a further £5, 10s on the 21st of November 1919 in Soldier’s Effects. In 1917 Hannah Hanton lived at 23 Church Street in Dorking. 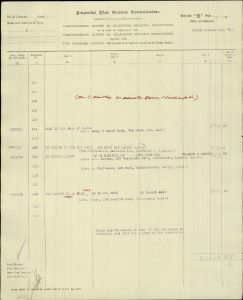 James’ father Charles James Hanton was born in the 1st quarter of 1854 in Ipswich to iron moulder Robert Hanton, born about 1810 in Sudbury, Suffolk and Mary Hanton, born about 1815 in Hanover, Germany. 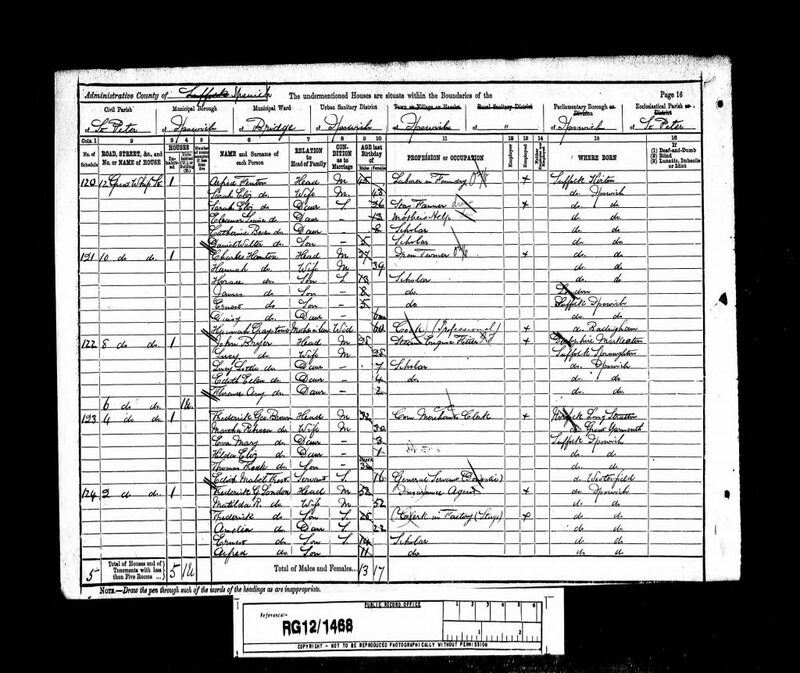 His mother Hannah Grayston was born in the 1st quarter of 1852 in Ipswich to smith James Grayston, born about 1822 in Newton, Suffolk and Hannah Grayston, born about 1824 in Bedingham, Suffolk. Charles James Hanton and Hannah Grayston married in the 3rd quarter of 1876 in the Registration District of Ipswich, Suffolk. At the time of the 1881 Census, the family lived in Park Lane, Colchester, Essex. Charles was working as an iron turner and Hannah was looking after their children: Horace and Lillie.